Product Review Time – Drybar! During the summer I was looking for a good shampoo and conditioner as my hair felt very damaged (I was growing it out for my wedding). I had never been to Drybar but knew the background of the company and how it got started so I was interested in reading more. Now that the line is sold at Sephora, I read up on my trust app about what customers had to say about it. Overall, it got great reviews so I decided to give it a try with their dry hair sample pack (no longer available). It included shampoo and conditioner, hair oil, cream and mask. I LOVED everything. First off, the scent is AMAZING and all the products in the entire line smell the same, which I love. Secondly, the packaging and design of all products is spot on – all items are named after alcoholic drinks since the salon is supposed to be a “bar”. Products I purchased were named Sake Bomb, Hot Toddy, 100% Proof, and Mudslide and everything is color coordinated back to the line and salon’s signature yellow and grey color scheme. I immediately ran through the Sake Bomb shampoo and conditioner and had to purchase the full size at Sephora (I was there anyway 🙂 The Hot Toddy heat protection cream and the 100% Proof hair oil are small but last a long time because you only need a small amount. The Mudslide is a deep conditioning mask in a travel size but I still haven’t used all of mine yet. 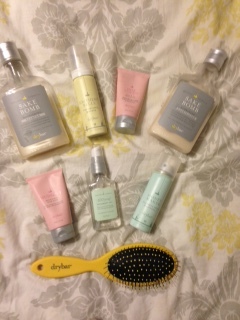 I was so impressed with the line I went to the Drybar salon near me and bought more products. I was thrilled to see how adorable and on brand the salon was designed – stylists were set up like bartenders behind a bar, there was a menu of choices at the receptionist table and all combs, clips, brushes and appliances were in the brands bright yellow color. How adorable! I purchased travel sizes of the Money Maker hair spray and the Southern Belle volumizing mousse as well as the yellow hairbrush named “Buttercup”. Later, I visited the brand’s website and watched the owner’s video tutorials on how to create the looks offered in the salon, such as the “Southern Belle” and the “Mai Tai”. The owner Alli actually starts with wet hair, the videos are short and she shows you how to get the look you want from start to finish using her products. I found this very clever and super relateable. I would definitely recommend this line if you are looking for a new (crazy amazing smelling) hair line and don’t mind spending a bit more on it. Seriously, I wish she made a perfume of this smell, it is that good. You can purchase all products at Sephora, but if you have some time and want to check out her website, you won’t be disappointed. It is cleverly worded and designed and provides a lot of great information on her brand and products. In today’s post I’m going to provide links to the overall brand sites and not the direct products because honestly I loved them all!